Judge a Book by Its Cover – What's So Funny? Thank you for stopping by. I have been telling you for a couple of weeks the day would come when I would post a couple of rough-draft cover options for my book. Well today, in the presence of God and all who surf the world wide web, that prophesy has come true. Before you pass judgment on the graphics, please take a few minutes and review the evidence. The 5 exhibits below are brief excerpts from the 28 short stories and essays contained in the book. Without further adieu, here they are. The schedule said we were to play the Giants, but I had no idea they meant that literally. My confidence began to wilt. The adrenaline crawled out of my veins and went scampering down a yellow streak that had once been my spine. On the first offensive series, I tried my best to “get in the way” of the 340 pound behemoth that loomed across from me. None of my tactics worked. My opponent looked like he had just escaped from a maximum security prison and had the attitude of an angry moose. He didn’t go around obstacles—he went through them. After the first three plays, I was more trampled than the grapes of wrath. ~ from What to Wear? What to Wear? “No,” replied David, rather indignantly. “Then you won’t mind taking a brain-wave field sobriety test,” said the officer. He plucked a gadget about the size of an iPhone from his shirt pocket, clamped the positive lead to David’s left ear and the negative to his right. David stared at the visor and tried to clear his mind. All my years of being an underachiever were about to pay off. I let my mediocrity shine at every available opportunity. How could they not notice me? Here I was, right under their noses, stretching two hours of work into four. One of my favorite things about peeves is that you can have as many as you want. In fact, I have an entire kennel of them. Peeves love attention and like to come out for a playful romp at every available opportunity. Like other pets, regular exercise is essential in keeping them healthy and happy. They start with basic left knee steering, then add more complicated maneuvers as the student becomes comfortable and gains confidence in hands-free operation of the vehicle. To graduate, attendees must be able to safely navigate the freeway at seventy-miles-per-hour, simultaneously text their best friend with one hand, apply mascara with the other, and scream at unruly children in the back seat. Upon completion, the girls receive a Beauty of the Boulevard ankle bracelet and a gift certificate for Maybelline eye-care products. Maybe it would “tempt” me to buy it rather than “temp.” 🙂 Just can’t stop, can I? I’d buy either cover. Ummm, we do get an actual book with the cover don’t we? “Peeves I Like to Pet” the clear winner. The picture of you conveys your sense of humor better, the colors are more vibrant, and you look like a guy, not a skeleton. Love “Dreams of Mediocrity” and “Dodging Miss Daisy” (which I read before) especially. Now put that book out, promote it, and become famous so I can be your worthless “hanger on.” And also …. wait a minute … “temp? … temp?” Proofreading, for god’s sake! I’ve been told that the brown stripe goes in back and yellow in front. Or is it the other way around? I’m hoping to break the 100 books-sold ceiling at some point in the next 5 years. I think I could make more money prophesying than writing. I love the Dreams of Mediocrity blurb. 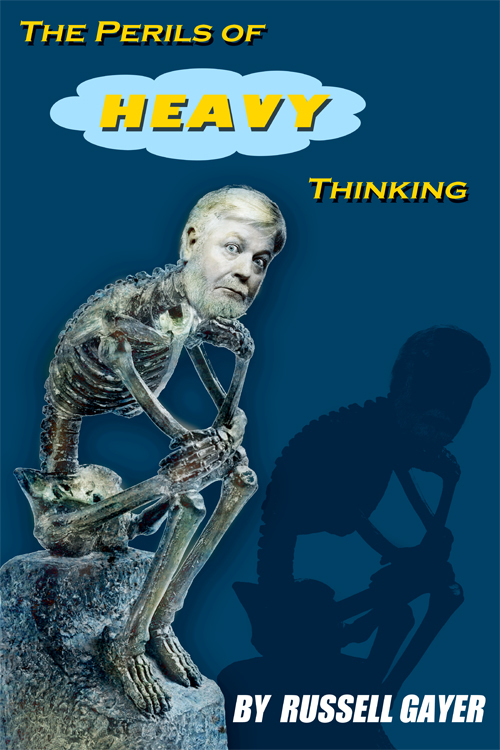 I think I like the ‘shorts’ cover better than ‘The Thinker’, but with your name on the cover, I’d buy either or both. I am so glad the book will soon be out! Thanks, Martha. It’s not easy being an underachiever. All this laziness and procrastination really wears a person out. After polling all family members, our house staff, the gardener and his workers, the chauffeur and his assistant drivers of our fleet of vehicles, we were able to gather a significant number of votes for Peeves I Like To Pet, which totaled two votes. My wife and I pretty much have to do it all. thanks for taking the time to round up the entire staff. I’m surprised there weren’t some dissenters in that crowd. Running a castle is not easy. Russell, if you have ever watched episodes of Downton Abbey, you can appreciate what we must go through to keep our entire staff on the same page, specifically your blog page. Both cover ideas a good. Personally and particularly, I prefer Peeves I like to Pet. Potentially pretentious? Possibly. But after painstaking pondering, this is my phinal answer. I always suspected you as a person with a pound of peeves to pet. Love them both, but underwear on the clothesline really speak to me. It’s always been a problem of mine. Daddy had to buy all the neighbors clothes dryers, but I still heard them speaking to me. Years of therapy later…well, you know what good that’s done. Anyway, the vote from Booger County says: Peeves I like to Pet. Thanks, Patty. I appreciate the back-story too. 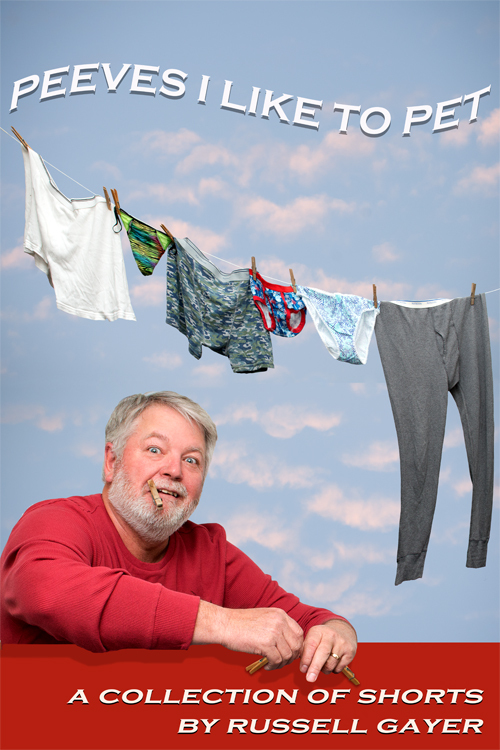 There’s nothing like briefs flapping in the breeze, unless of course, it’s a thong. Love the red in Peeves I Like To Pet, your smiling face, and the fresh undies on the line. I think it’ll show up better in a thumbnail on social media and Amazon, too. Love the excerpts and am glad you’re publishing your humor writing. Congrats! Thanks for inviting me to participate. I prefer, “Peeves I like to Pet”. For several reasons, but of course top of mind for me are the graphics and their visual impact. 100 books will keep you very busy……Enjoy the journey. Thanks for weighing in, Joe. You’ve been in packaging a long time and I value your opinion. I like both and am having one of those, ‘dammit someone got there before me’ moments with the clothes line one. Am looking forward to reading all 28 shorts. 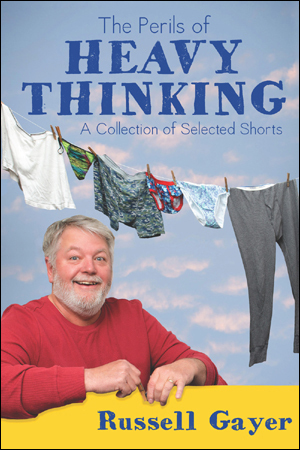 Well, you know which one I like, darling, but you know, that whole “A Collection of Shorts” bit is irresistibly clever. Russell I love the first one. That look on your face! LOL!! I was just getting ready to take a bite of a piece of chocolate cream pie and missed my mouth and it landed on the keyboard when I saw it. This is absolutely true! That should tell you something but I’ll be darned if I know what. — but since it’s a humor book it’s probably a good sign. The shorts concept is a good play on words too and I love the petting of the Peeves. Am I too late to vote? I agree with the others, Peeves is the winning cover. Everything about it is perfect.